It just stopped snowing in Wisconsin a few days ago but somehow I’ve already missed all the swimsuit sales. Headed to Florida for a 3-day weekend (which is as close as I’ll get to Spring Break in Grown-Up Land) and forced to fork over more than I intended for a nice swimsuit, I was looking for a bargain wherever I could. I found it at 7-11 where, aside from my pre-flight protein shake, I found a collection of tropical-looking energy drinks that were 10 for $10! Colorful, affordable, low-cal and, better yet, they passed the Food Scientist Label Inspection (meaning they actually had substance and not just amateur combinations of caffeine and sugar) – SOLD! The Energy Drink of the Month for May 2014 is vitaminwater® energy beverage Berry Punch. This is not to be confused with the vitaminwater® Energy that comes in a plastic bottle and looks yellow. 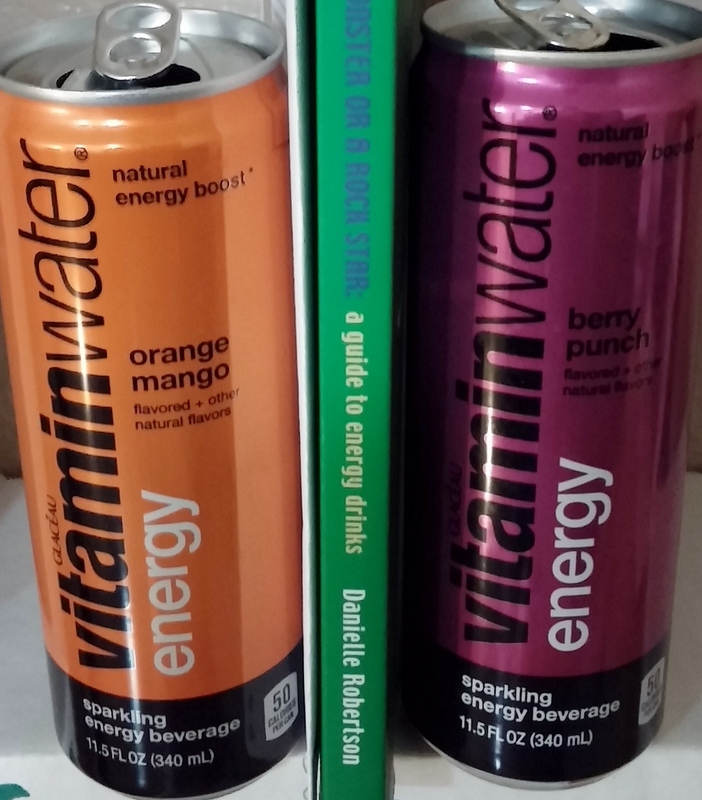 Other flavors of this vitaminwater® energy beverage product line include Strawberry Lime, Raspberry Citrus, and Orange Mango. I enjoyed all four flavors but I think I prefer Berry Punch, and not just because the can matches the color scheme of my phone, my shoes, my watch and my new swimsuit. Anecdotes and silliness aside, let’s look at the science behind what makes this drink the Energy Drink of the Month. 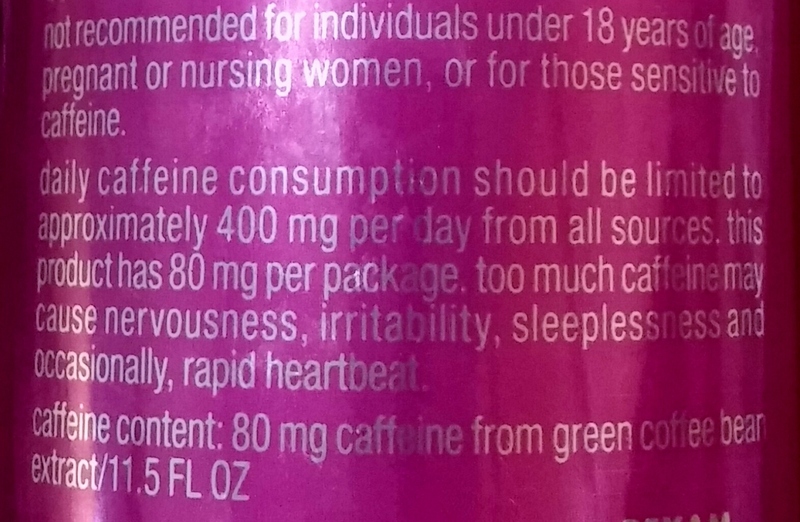 This is the first time I recall seeing the 400mg amount mentioned with a list of potential side effects in addition to the amount of caffeine per can. I applaud this label and even though it takes up quite a bit of space, I hope more energy beverages follow suit. I know it would please a lot of concerned consumers to have this much transparency on a label. Look at how detailed and specific – I LOVE IT! CON#1: Their cApitAlization BotheRS me. 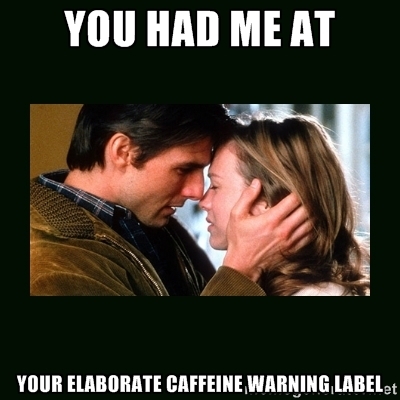 As a food scientist and product developer-turned-quality assurance specialist, I’m growing even more cognizant of how ingredients are supposed to be represented on a label, and the types of marketing inconsistencies that can cause insignificant but non-trivial issues. Case in point, I can’t tell you how many emails I’ve received in the past year, reminding my colleagues and me how not to refer to the company on controlled documents, specifications, labels etc. 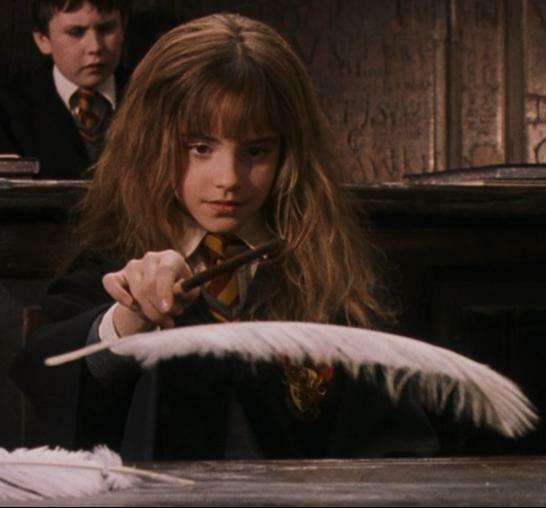 I understand that conventional grammar and capitalization have become optional for some of the younger crowd. I am a Millennial but we watched School House Rock in school so I’m prepared to blame the next generation for this (are they the post-Millennials?). This capitalization inconsistency is not a real problem, it’s a PR problem. Online there are multiple deviations of vitaminwater®/VitaminWater®/Vitaminwater®/Vitamin Water® (see example for each by clicking on each name). When newspapers and articles can’t refer to your product consistently it seems your brand walks the fine line between being artistic and being unorganized. Some of us don’t care. However, it bothers me. 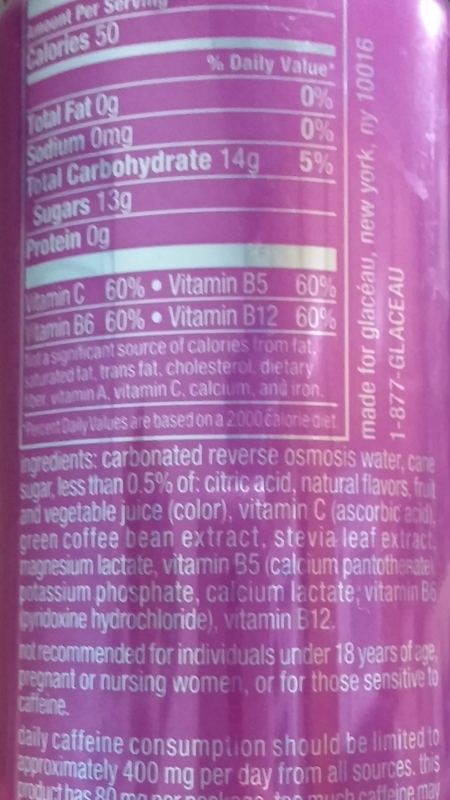 This product has 80mg of caffeine per 11.5 ounce container, which is the same amount of caffeine in an 8 ounce can of Red Bull or V8 V-Fusion + Energy. It’s also about the same amount as a tall latte from Starbucks (but caffeine content from brewed coffee can vary wildly based on brewing methods). The caffeine content and green coffee beans source put this product at a Level Two in the 5 Levels of Fatigue from the Energy Drink Guide. Carbonation can irritate the stomach lining and speed up absorption of caffeine. However, the carbonation in these beverages doesn’t seem as intense or to last as long as the carbonation in a similar product (see Energy Drink of the Month for August and see my comments at the bottom of this sugar-free-cherry-citrus review). For products with at least 5% juice, carbonation is going to be mild. For the non-juiced energy beverages, I enjoy a bit of carbonation so I can tap into the Placebo Effect and instantly feel like the caffeine is working (note – caffeine takes about 20 minutes to kick in if you consume it in liquid form, but Placebo Effect is almost always instantaneous). As a product developer, I understand how difficult it can be to create a suitable sweetener system for a beverage or supplement. Consumers want something sweet, but not too sweet; ideally there’d be zero grams of sugar but also no artificial sweeteners, regardless of which ones have been scientifically proven safe. Stevia and Monk Fruit seem to be answering that demand for natural alternatives to sugar, but it can be quite a challenge to find a clean source of Stevia and use an amount that doesn’t come with a bitter aftertaste (see “The Linger”). This product line does use cane sugar with stevia, and the result is a sweetness profile without reproach. I don’t like to drink my calories and I try to opt for sugar-free/no-sugar-added products wherever possible. There are 13 grams of sugar in this product which is about 7 grams more than I’d prefer, if I had it my way. 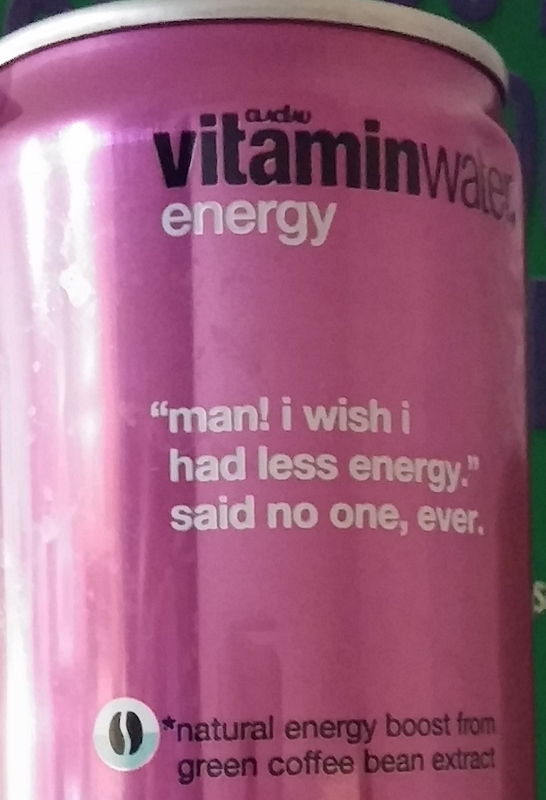 Though I have no organoleptic issues with the sweetness profile of the vitaminwater® energy beverages, I still wish there were sugar-free versions. 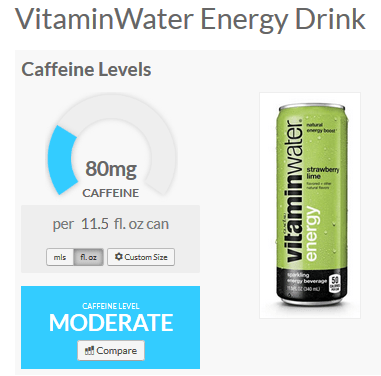 For those on a budget who are looking for a healthy alternative to the stereotypical energy drink, I recommend trying vitaminwater energy beverages. You can probably find them at your local 7-11, which makes them great for road-trips or the last-minute caffeine run in preparation of a morning commute battle (is it just me or is stop-and-go traffic like being in a rocking chair?). The colorful cans and moderate caffeine boost serve as a nice boost without the high-powered shove or sugar-shock of the other drinks you’d normally find at a gas station or convenience store. Get your copy of Are You a Monster or a Rock Star: a guide to energy drinks HERE, here or at your local bookstore with the ISBN codes found here.